Тема в разделе "Архив: Список неактивных/закрытых программ", создана пользователем All-HYIPs.info, 3 апр 2018. 05.12.18 05:22;Account;Receive;Received Payment 1.2 USD from account U16345669 to account U1294000. Batch: 238587912. Memo: API Payment. Withdraw to allhyips from Crypto Mercury LTD.
10.12.18 19:37;Account;Receive;Received Payment 1.2 USD from account U16345669 to account U1294000. Batch: 239168760. Memo: API Payment. Withdraw to allhyips from Crypto Mercury LTD.
15.12.18 07:11;Account;Receive;Received Payment 1.2 USD from account U16345669 to account U1294000. Batch: 239608661. Memo: API Payment. Withdraw to allhyips from Crypto Mercury LTD.
26.12.18 19:19;Account;Receive;Received Payment 1.2 USD from account U16345669 to account U1294000. Batch: 240671567. Memo: API Payment. Withdraw to allhyips from Crypto Mercury LTD.
02.01.19 05:46;Account;Receive;Received Payment 1.2 USD from account U16345669 to account U1294000. Batch: 241469699. Memo: API Payment. Withdraw to allhyips from Crypto Mercury LTD.
07.01.19 19:45;Account;Receive;Received Payment 1.2 USD from account U16345669 to account U1294000. Batch: 241997513. Memo: API Payment. Withdraw to allhyips from Crypto Mercury LTD.
12.01.19 06:51;Account;Receive;Received Payment 1.2 USD from account U16345669 to account U1294000. Batch: 242470506. Memo: API Payment. Withdraw to allhyips from Crypto Mercury LTD.
18.01.19 06:50;Account;Receive;Received Payment 1.2 USD from account U16345669 to account U1294000. Batch: 243100392. Memo: API Payment. Withdraw to allhyips from Crypto Mercury LTD.
24.01.19 06:43;Account;Receive;Received Payment 1.2 USD from account U16345669 to account U1294000. Batch: 243745490. Memo: API Payment. Withdraw to allhyips from Crypto Mercury LTD.
29.01.19 19:21;Account;Receive;Received Payment 1.2 USD from account U16345669 to account U1294000. Batch: 244353104. Memo: API Payment. Withdraw to allhyips from Crypto Mercury LTD.
09.02.19 04:43;Account;Receive;Received Payment 1.2 USD from account U16345669 to account U1294000. Batch: 245850602. Memo: API Payment. Withdraw to allhyips from Crypto Mercury LTD.
15.02.19 02:46;Account;Receive;Received Payment 1.2 USD from account U16345669 to account U1294000. Batch: 246573216. Memo: API Payment. Withdraw to allhyips from Crypto Mercury LTD.
20.02.19 19:29;Account;Receive;Received Payment 1.2 USD from account U16345669 to account U1294000. Batch: 247308519. Memo: API Payment. Withdraw to allhyips from Crypto Mercury LTD.
04.03.19 18:37;Account;Receive;Received Payment 1.2 USD from account U16345669 to account U1294000. Batch: 249309145. Memo: API Payment. Withdraw to allhyips from Crypto Mercury LTD.
09.03.19 09:18;Account;Receive;Received Payment 1.2 USD from account U16345669 to account U1294000. Batch: 249968100. Memo: API Payment. 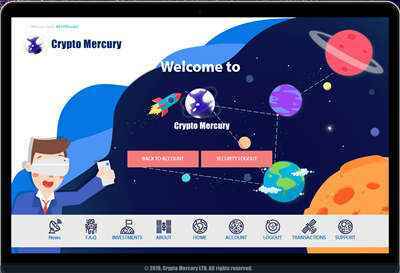 Withdraw to allhyips from Crypto Mercury LTD.
27.03.19 06:06;Account;Receive;Received Payment 1.2 USD from account U16345669 to account U1294000. Batch: 252795646. Memo: API Payment. Withdraw to allhyips from Crypto Mercury LTD.
02.04.19 04:41;Account;Receive;Received Payment 1.2 USD from account U16345669 to account U1294000. Batch: 253927454. Memo: API Payment. Withdraw to allhyips from Crypto Mercury LTD.
06.04.19 02:58;Account;Receive;Received Payment 1.2 USD from account U16345669 to account U1294000. Batch: 254549760. Memo: API Payment. Withdraw to allhyips from Crypto Mercury LTD.
12.04.19 03:53;Account;Receive;Received Payment 1.2 USD from account U16345669 to account U1294000. Batch: 255435296. Memo: API Payment. Withdraw to allhyips from Crypto Mercury LTD.